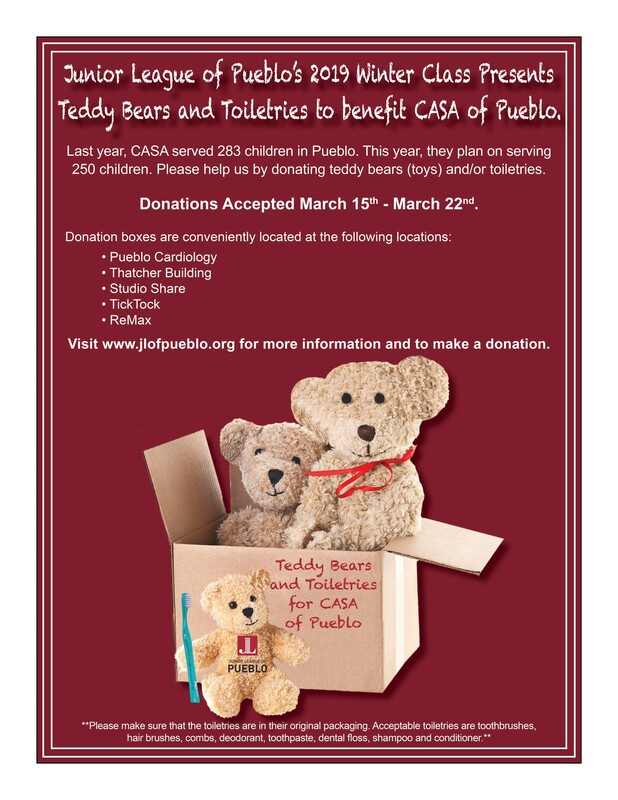 The Junior League of Pueblo’s Winter 2019 New Member Class is running a Teddy Bear & Toiletries drive benefiting CASA of Pueblo March 15th-22nd. Of the 283 children that were served by CASA last year, many of the children were placed into foster care without having their own tooth brush, comb, shampoo or toys. We are hoping to collect enough teddy bears & toiletries to provide these essentials to all of the 250 children CASA hopes to serve this year. Donations will be collected at the following locations: Pueblo Cardiology, Thatcher Building, Studio Share, TickTock and ReMax. Please help the Winter 2019 New Member Class of Pueblo’s Junior League reach our goal by dropping off a donation or making an gift online: CLICK HERE to make a donation!